Now you can carry your favorite computer programs along with all of your bookmarks, settings, email and more with you. Use them on any Windows computer. All without leaving any personal data behind. 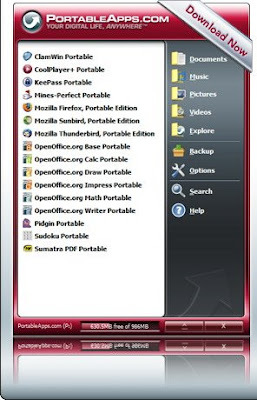 PortableApps.com provides a truly open platform that works with any hardware you like (USB flash drive, iPod, portable hard drive, etc). It's open source built around an open format that any hardware vendor or software developer can use. The PortableApps.com Suite and Platform is free. It contains no spyware. There are no advertisements. It isn't a limited or trial version. There is no additional hardware or software to buy. You don't even have to give out your email address. It's 100% free to use, free to copy and free to share.